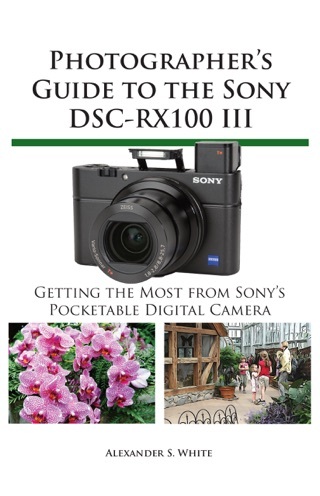 This book is a complete guide to the Sony Cyber-shot DSC-RX10 IV camera. 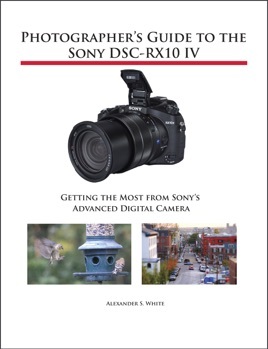 With this book, author Alexander S. White provides users of the RX10 IV with a manual covering all aspects of the camera’s operation. Using a tutorial-like approach, the book shows beginning and intermediate photographers how to accomplish things with the RX10 IV, and explains when and why to use the camera’s many features. The book provides details about the camera’s shooting modes as well as its menu options for shooting, playback, setup, video, Wi-Fi, and special effects. 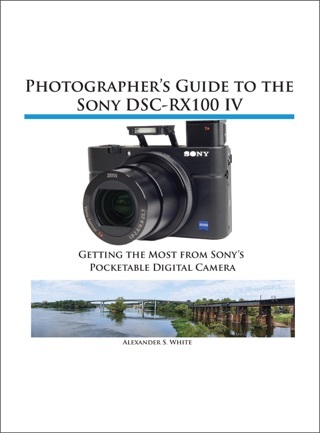 The book covers all features of the RX10 IV that are new for this model, including its enhanced focusing system with phase detection autofocus; its ability to use a touch screen for focusing and enlarging images in some situations; and a variety of new or enhanced menu options. The book includes more than 500 color photographs that illustrate the camera’s controls, display screens, and menus. The images include photographs taken using the RX10 IV’s Scene mode, with settings optimized for subjects such as landscapes, sunsets, portraits, and action shots; and its Creative Style and Picture Effect menu options, with settings that alter the appearance of images. 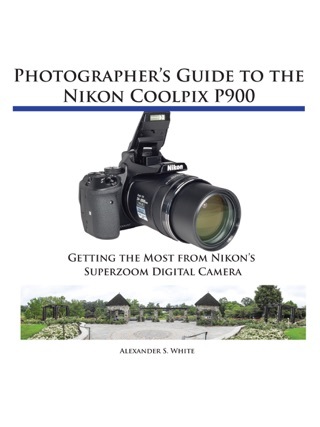 The book provides concise introductions to topics such as street photography and infrared photography, and explains how to use the camera’s Wi-Fi and Bluetooth features to transfer images to a smartphone or tablet, to control the camera from such a device, and to add location information to images. 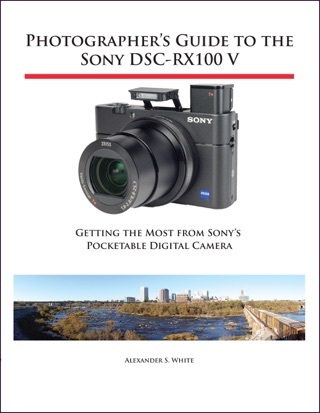 The book includes a full discussion of the video features of the RX10 IV, which can shoot HD and 4K (ultra-HD) movies, with manual control of exposure and focus during recording. The book explains the camera’s numerous features for professional-level videography, including Picture Profiles that allow adjustment of settings such as gamma curve, black level, knee, and detail. The book describes steps for recording 4K video to an external video recorder using the “clean” video output from the camera’s HDMI port. 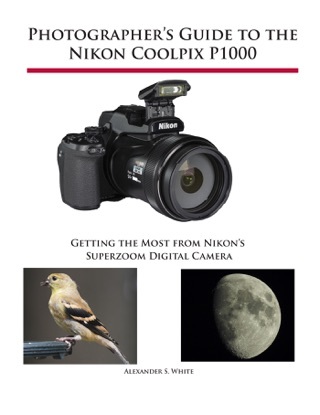 In three appendices, the book discusses accessories for the RX10 IV, including cases, power sources, remote controls, microphones and external flash units, and includes a list of websites and other resources for further information. 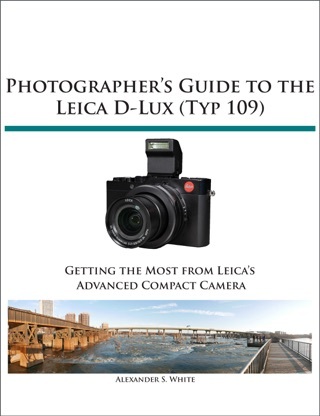 The book includes an appendix with “quick tips” on how to take advantage of the camera’s features in the most efficient ways possible. This guide to the RX10 IV includes a detailed index, so the reader can quickly locate information about any particular feature or aspect of the camera.